Sanding can be an integral part of the wood working industry. From do-it-yourself projects to large industrial manufacturing the appropriate sanding equipment can be the difference between low or high quality products. In the industrial setting wide belt sanders like Grizzly, Timesaver, SCM or Cantek are commonly used in the manufacturing of windows, doors, and many other wood products. Sanding equipment such as wide and narrow sanding belts, discs, hand-pads and other abrasive products are all available at Centric Inc. But what makes up a sanding belt? 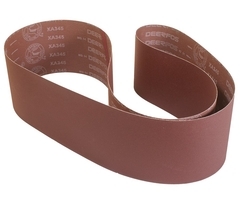 The three elements of a sanding belt are; backing, abrasives, and bonding. Backing, abrasives, and bonding can be combined in various ways dependent on production, material and desired finish. Backing refers to the type of material that is used as a base for the sanding belt. Backings are commonly made up of either cloth or paper. Dependent on backing will determine what weight class the belt; which determines what capacity that belt should be used. Paper backing weight is graded on strength and flexibility. The most common paper backing weights for tough grinding are D-weight, E-weight, and F-weight. D-weight also called “Cabinet” is designed for heavy work. E-weight is very strong and used primarily when high resistance of tearing is needed and is suited for a verity of operations in roll, belt, or disk form. F-weight is the strongest and least-flexible paper backing. Cloth backing are commonly made from cotton or polyester. The common weights are J-weight, Y-weight, and X-weight. J-weight is the lightest and most flexible, best used when finish is more important than stock removal. Y-weight is more resistant to longitudinal splitting. X-weight is a strong and adaptable cloth backing designed for heavy stock removal as-well as light finishing or polishing. Cloth backed sanding belts are more resilient and adaptable than paper and used commonly in the woodworking industry. Centric offers various sizes and grits of paper and cloth sanding belts, discs and other abrasive products. Abrasive refers to the mineral that is used to remove stock from material. Abrasive for sanding products are designated by hardness, toughness, heat resistance, shape, and fracturing. Abrasive particles break during sanding exposing new and sharp edges to remove stock. The main types of abrasives are aluminum oxide, zirconia alumina, silicon carbide, and ceramic. Aluminum oxide is a chemical compound of aluminum and oxygen. Aluminum oxide is a common abrasive for sandpaper that works on wood, plastic, metal, and drywall. Aluminum oxide is wedge-shaped and extremely tough for high-speed penetration of materials without extreme fracturing. Zirconia alumina is a rugged compound with self-sharpening characteristics. These characteristics give this abrasive a long life when used for rugged stock removal. Zirconia alumina is well suited for heavy grinding of metals but is suitable for the planning of hardwoods. Silicon carbide and ceramics are the hardest and sharpest of the minerals used in sanding abrasives. The hardness and sharpness of these two minerals make them ideal for grinding nonferrous metals. Bonding refers to the adhesive used to bond the abrasive material to the backing. Bonding is a significant factor in the performance of the sanding products. There are two types of bonding: glue bond and resin bond, there is a third bonding that combines both which is called resin over glue bond. Glue bond products use animal hide glue for the first and second adhesive coats. Resin bond is liquid phenolic or urea that can be modified for faster or slower drying times that determine strength, flexibility and other desirable properties. A resin over glue bond product has a resin coat is applied over a glue bond to combine the heat resistance of the resin with the flexibility of glue. During normal operations it is common for removed stock to “gum” up a sanding belt. If a sanding belt is filled with removed stock material the abrasive is unable to break away revealing a new and sharper sanding surface. A belt cleaning stick available at Centric Inc will easily and inexpensively remove the “gummed” stock material from your sanding belt. Removing excess material allows for a new layer of adhesive to be exposed and continue sanding. For more information please contact Centric Inc via phone at 715-848-4242 or email us at info@centrictool.com. You can also find us on the web at www.centrictool.com and coming soon in 2018 Centric Inc is proud to announce our new eCommerce online store.